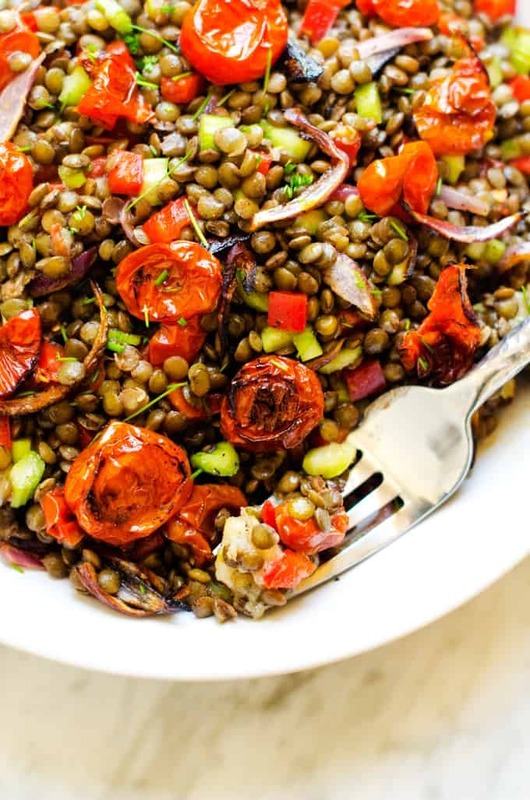 This healthy lentil salad is made with sweet roasted tomatoes which are perfectly balanced with roasted garlic and onions. With crunchy celery and sweet red pepper, this salad is tossed in a simple lemon vinaigrette with just a subtle hint of heat. This dish is perfect to make on the weekend for meal prep. It is excellent on its own for a light lunch, a great way to add protein to grain bowls, and works beautifully as a bed for meats at dinnertime. You definitely don’t want to miss this one! 3.1 Can I Use Any Type of Lentils in this Salad? 3.2 Do I Have to Soak Lentils Like I Soak Beans? 3.3 Can I Freeze Cooked Lentils? 4 Want to Mix Things Up? Try these Variations! I had no intention of publishing this recipe today, but I couldn’t stop myself. It is the best thing I have made in a long time. The last few days I’ve been a bit under the weather. And by a “bit” I mean I slept about 14 hours yesterday. Anyone who knows me knows I can’t nap to save my life, so this is a pretty major “what the heck is going on” kind of thing. I woke up today feeling a little better and decided to spend the day on the couch and playing with Skye. 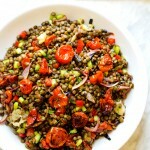 Then I started thinking about food and knew I had everything to make this Lentil Salad on hand. I decided that a healthy lunch was just what I needed and that I could always photograph it tomorrow. Then one thing leads to another. I decided to take just a few quick shots on my new background hubby got me. (Love it.) And then I tasted the salad. I can’t remember the last time I enjoyed something as much. (And certainly not a cold lentil salad.) After not eating yesterday, this was just what I needed. 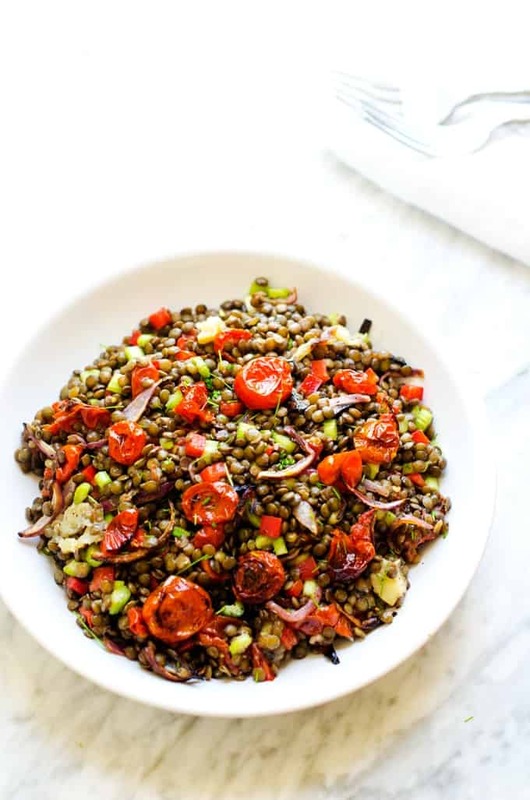 If you’ve tried this Lentil Salad or any other recipe on the blog then don’t forget to rate the recipe and let me know how it went in the below comments, I love hearing from you! You can also FOLLOW ME on FACEBOOK, TWITTER, INSTAGRAM, and PINTEREST to see all my recipes. Cut the top of your head of garlic with a very sharp knife. 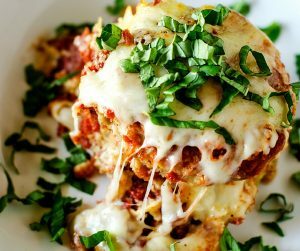 Place in a small oven-safe dish and drizzle with 1 teaspoon of oil. Cover. Arrange the tomatoes and onion in a single layer and drizzle with oil. Sprinkle with salt and pepper. Place the tomatoes and the garlic in the preheated oven. Cook for 25 to 30 minutes, until the tomatoes are slightly shriveled. Carefully open the garlic and allow to cool. Press the cloves from the heat of garlic and place in a small bowl. Break the garlic into smaller pieces with the back of the fork. WHILE THE TOMATOES AND GARLIC ARE COOKING, bring broth to a boil. Add the lentils and reduce heat. Simmer, covered, for 25 to 30 minutes, until tender. Drain and transfer to a bowl. Add garlic, tomatoes, red onion, celery, and red pepper to the dish. Make the dressing by combining olive oil, lemon juice, and crushed pepper in a small bowl. Whisk to combine and season to taste with salt and pepper. 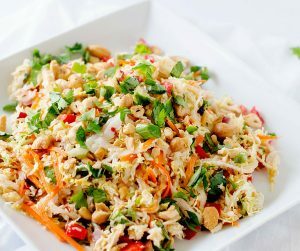 Toss dressing with lentil mixture and serve at room temperature or cold. Can I Use Any Type of Lentils in this Salad? I recommend using green, brown, or black (beluga) lentils for this recipe. Green lentils are mild in flavor and cook relatively quickly. Brown lentils work and cook in about the same time as green, but they do tend to get mushy and don’t have quite as much flavor as green. (For these reasons I prefer green.). Black lentils are small and shaped like caviar. They have a great firm texture and take between 30 and 40 minutes to cook. 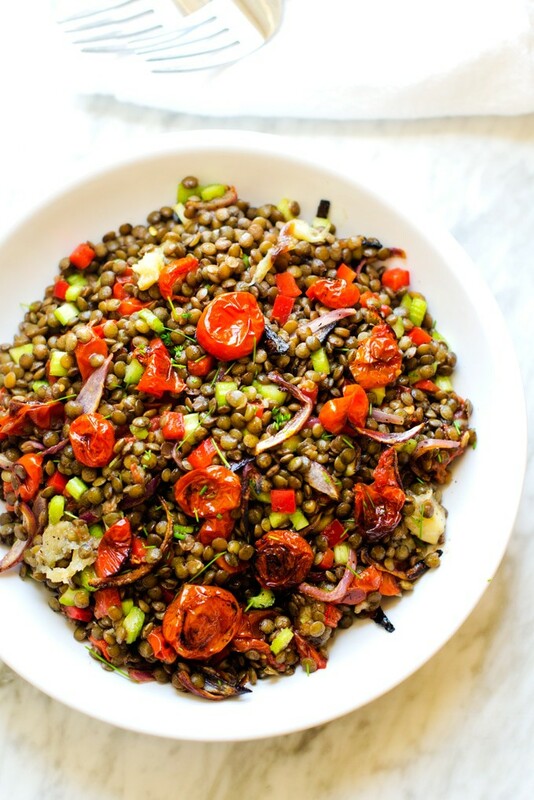 I do not recommend using white, yellow, or red lentils in this lentil salad. They turn mushy very quickly, and I much prefer to use these types of lentils in thick soups or dal. You can learn more about the types of lentils and their uses here. Do I Have to Soak Lentils Like I Soak Beans? No! Lentils do not require soaking. Can I Freeze Cooked Lentils? Yes, lentils freeze beautifully! I recommend making a double batch and freezing half of them in single serving portions to thaw and toss into salads. Want to Mix Things Up? Try these Variations! 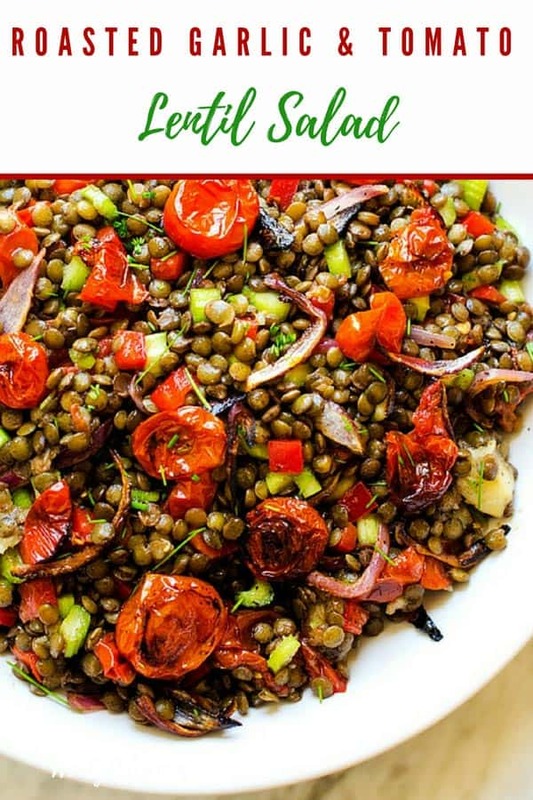 This Roasted Garlic & Tomato Lentil Salad is the perfect vegan cold lentil salad that everyone will love! With roasted garlic, oven roasted tomatoes and onions, this is one you don't want to miss. Cut top of garlic head and place in foil. Drizzle with 1 teaspoon of oil and close foil around garlic. Line a baking sheet with parchment paper. Arrange tomatoes and onion in a single layer and drizzle with avocado oil. Sprinkle with salt and pepper. Place garlic and tomato mixture in a preheated oven and cook for 25 to 30 minutes, until slightly shriveled. Carefully open garlic and allow to cool. Gently press cloves from garlic head and place in a small bowl, breaking garlic into smaller pieces with the back of a fork. Meanwhile, bring broth to a boil. Add lentils and reduce heat. Simmer, covered, for 25 to 30 minutes, or until tender. Drain and transfer to a bowl. Add garlic, tomatoes, red onion, celery, red pepper to the bowl. Make dressing by combining olive oil, lemon juice, and crushed pepper in a small bowl. Whisk in salt and paper to taste. Toss with lentil mixture and serve. Previous Post: « Must Have Fitness Finds for the New Year! This looks really good. I am a great lentils person so this is definitely on my list! I just made this tonight and it was a huge hit. I will definitely make it again, but I do think I’ll leave out the red peppers. I’m not a fan of them so for me they dominated the flavor, but I still thoroughly enjoyed it nonetheless. And my hubby had 2 helpings! So glad you enjoyed it Joan! What a positively stunning recipe Wendy! I can’t believe how vivid the photo is and how much I now want a bowl of lentils! Hi Wendy, This recipe looks delicious. I was looking for something to bring to my cousin’s house for Easter and I was wondering if this is served warm or cold? I served it at room temperature, but it would be delicious either way. Hi Wendy, This look delicious. I assume it is served room temp to warm immediately after making it. For the next two days is it best to serve cold right from the fridge or warmed up at a bit before eating? Hi! Since you are in the UK they may be called something different. It is crushed red pepper flakes. Ive made this twice and it is delicious but I did the roasted veggies on the BBQ. I ADDED DIJON TO THE DRESSING. I love this recipe! A winner in my house! I’ve made this a few times and it is very delicious! Today I had fennel from my CSA so I diced it up and added to the tomatoes and onions before roasting. So glad you enjoy this one as much as I do. I love the addition of fennel – I’m going to try that next time. Thank you! Made this today and absolutely loved it. Wonderful dish! I made this as part of our crew dinner tonight and everyone loved it. Especially my head chef. Thank you for the recipe! What do you mean by “cut the garlic head”? Like cut it in half? You cut the papery top off. Fantastic recipe!!! Made the salad with beluga lentils because they’re so delicate and hold their shape. I’m vegan but I made pan roasted chicken thighs for my husband – perfect combo. I found that I had to roast the garlic @400 for 45 minutes. Other changes I made: sautéed 1/2 cup each of chopped celery, purple carrots and yellow pepper; When roasting tom and onions I cut the onions into 1” chunks so they wouldn’t burn as slivers – chopped them up later; Added 1 tbl spn dijon mustard to the dressing. This has become a family favorie at my house, I mistakenly left out the red pepper and celery the first time I made it and had it warm with grilled salmon. Fantastic! Haven’t made it “the right way” yet! That is amazing!!!!! I also added Dijon mustard and used the variety pack of multi-colored mini tomatoes, and it looks so appetizing. It will be a great lunch tomorrow with some soup! !